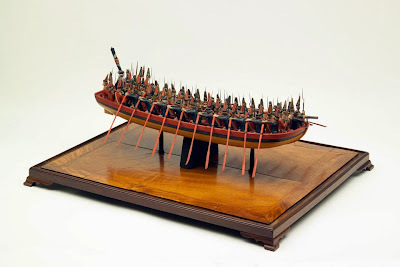 Model of a flat bottomed landing craft, artist unknown, c.1756, National Army Museum. This should look familiar. 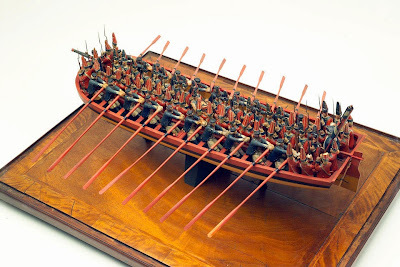 We have featured model boats just like this one in the past. The oarsmen are relatively uniform, but not entirely so. A close look shows that while their caps and jackets are all a matching blue, and all wear their jackets with open cuffs. Likewise, they all wear matching white slops. Their stockings and waistcoat, however, are as varied as the men thesmelves. 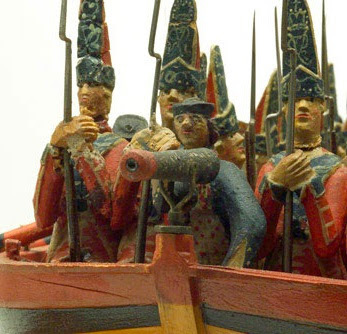 Stripes, spots, and solids abound, but all are in the three colors that are used in both the sailors' and the soldiers' clothing: blue, red, and white. Notably none of the sailors are wearing striped stockings. At the bow, a single tar sits ready at the swivel. He wears a blue jacket with open cuffs and metal buttons. His cap matches those of the other sailors, and his waistcoat is a white one spotted with red.